New York, April 6, 2009 -- Citigroup (NYSE: C) and Bank of America (NYSE: BAC) today jointly announced the launch of an innovative program, dubbed ATM Instant Equity Exchange, under which the two banks will commence dispensing stock vouchers rather than cash from ATMs under their control. Wells Fargo (NYSE: WFC) is expected to sign on to the program later in the week. Citibank, co-founder of the AIEE! program: Photo (CC) Ed Yourdon. "The ATM Instant Equity Exchange program, or AIEE!, is intended to meet two pressing needs in banking at once: the desire of banking customers to withdraw assets from their bank accounts, and the unwillingness or inability of banks to release any actual cash," Philip McNoulty, a strategic analyst with Fisher & Kelp Asset Management, said. "I think the idea's headed for success." Under the AIEE! program, banking customers who visit an ATM to withdraw cash will instead receive a voucher for bank stock equal to the current market value of the withdrawal. 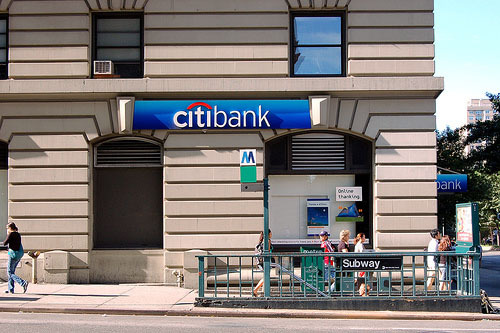 In other words, a Citi or Bank of America customer who wishes to withdraw $100 from an ATM will receive, rather than the customary five $20 bills, an embossed, holograph-protected voucher granting that customer $100 of stock in Citigroup or Bank of America at the current share price. (If markets are closed, the shares will be valued at the most recent closing price). "Customers can redeem those Citi share vouchers for cash at any of our corporate branches or via a broker any time they want, starting a minimum of 30 days from the date of the withdrawal," Robert Malarkey, a vice president for corporate communications at Citigroup, said. "Although we think it would be wiser to hold on to them. Banking equities are likely to bounce back with a vengeance any day now." Equity exchange withdrawals will be financed via the instant issuance of new common stock at the time of the ATM transaction, leading to concerns from major stockholders and hedge fund managers that the AIEE! program may lead to a gradual dilution in value of existing shares. Mr. Malarkey was quick to assure investors that their holdings were secure. "Think about it," Mr. Malarkey said. "If each ATM withdrawal reduces the value of existing shares by a certain amount, then the next withdrawal will result in a greater number of shares being issued on the voucher, which means more long-term value for the customer. And the one after that will have even more shares, and so on, and so on. That's win-win." Shares of Citigroup and Bank of America were down 18 and 22 percent, respectively, on the announcement.